Tools — Christina Made It. 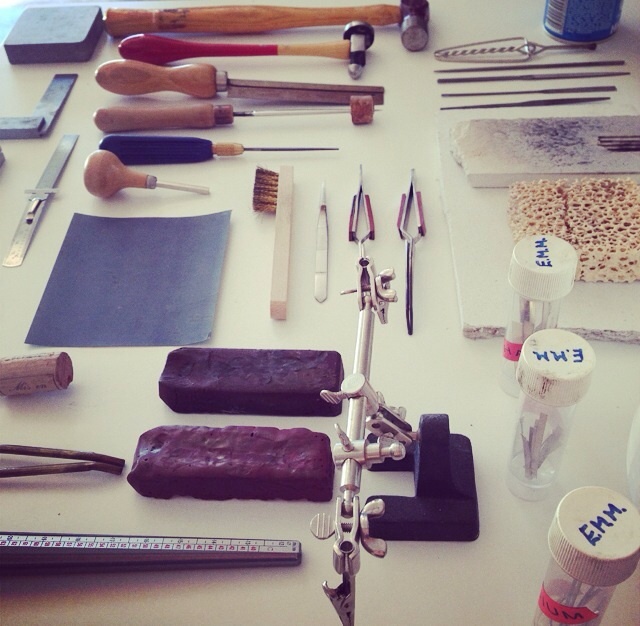 The one major thing I was missing from my silversmithing business were the tools. You can't make anything without the tools. So I set about sourcing them. Anyone who is interested in starting their own jewellery business, I will warn you now. You will need A LOT of tools. I've put together a list of all the 'essentials' and I can tell you, there are quite a few! If you can, I would recommend getting everything second hand, you really don't need to have a full set of brand new tools. Some of the 'wise ones' at the jewellery club kindly donated a few pieces to me, it was a bit like a tool amnesty (if you are a jewellery maker and have some spare tools, feel free to donate! I'm a good cause) some other pieces I purchased from a well know auction site. Here are my tools in all their glory arranged in a very OCD orderly fashion. Quick possibly the cleanest workbench in the history of silversmithing. 1 Blow Torch. 2 Saw Blades. 3 Small Files. 4 Pickling Solution. 5 Flux. 6 Slow Cooker. 7 Heat Proof Mat. 8 Silver Hammer. 9 Straight Saw. 10 Burnisher. 11 Needle File. 12 Easy, Medium & Hard Solder. 13 Third Arm. 14 Pusher. 15 Tripolloi & Rouge. 16 Ring Sizer. 17 Mandrel. 18 Brass Tongs. 19 Centre Punch. 20 Small Vice. 21 Measuring Tools. 22 Steel Block. 23 Set Square. 24 General Purpose Hammer. The main areas you need tools for are; cutting, shaping, measuring, soldering and polishing. Just a few items to get you started! It really is down to preference though (or how much money you want to spend!) You may prefer a barrel polisher or a polishing wheel instead of a Dremel, this also may be dependant on space. Right now I have all my kit I better get cracking on with the back log of orders I have! Special moment using the tools for the first time!